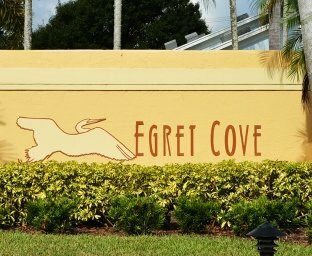 Egret Cove is an attractive gated community located in Maplewood. This family friendly community has 55 detached single family homes, with 3 to 4 bedrooms and constructed of concrete block. A low HOA covers cable, lawn and community pool maintenance. Basketball, tennis and racquet ball courts are nearby at Maplewood Park. The sandy Jupiter beaches are just a few minutes away as are amazing dining and shopping options. Both private and public schools are nearby. Turtle River Montessori, Jerry Thomas Elementary and Jupiter Academy are some of the top rated schools close to Egret Cove. PRICED FOR QUICK SALE!!! Put your own personal touches in this CBS 3/2/2 home in Highly desired gated community in central Jupiter with low HOA-Convenient location close to A rated public & private schools, churches, banks, stores etc. Easy access to freeway & turnpike. Newer appliances, gas stove, water heater & dryer. VACANT, EASY TO SHOW!!! !